Dr Abdul Jalil Al-Singace, the Chairman of the Human Rights Committee of the Haq Movement, which promotes human rights and democracy in Bahrain, was arrested at Manama Airport on the morning of 13 August, as he and his family returned to the country from London. His arrest came the day after the ruler of Bahrain, Shaikh Hamad bin Isa al-Khalifa, appealed for critics of the government to return to the country, promising them freedom of speech and action. It was also just days after he had attended a seminar at the House of Lords on 5 August, discussing the human rights situation in Bahrain. He had also had meetings with the Islamic Human Rights Commission, Amnesty International and other human rights groups. Al-Singace’s arrest was followed by the arrests of several other senior activists. Abdul Ghani Al-Khanjar, the spokesman of the Committee of Martyrs and Victims of Torture, Sheikh Saeed Al-Nouri and Sheikh Mohammad Habib Al-Miqdad, who have campaigned against political repression in the country, were arrested in early morning raids on their homes on 16 August. Several other activists had already been arrested on 14 and 15 August, as protests against Al-Singace’s arrest spread around the country. Shortly after Al-Singace’s arrest, the IHRC contacted Sheikh Hamad Abdullah Bin Khalifa, Head of Security in Bahrain, who confirmed that Al-Singace was being held but refused to give any further information. 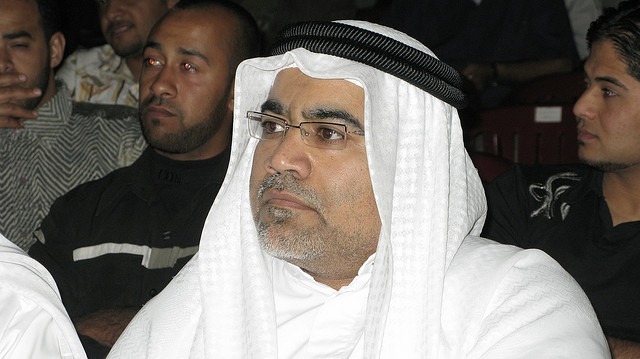 The following day, on 14 August, the Bahraini News Agency reported an “official security source” as saying that Al Singace had been arrested on national security grounds, accusing him of inciting violence. The current whereabouts of Al-Singace, who is disabled and restricted to a wheelchair, is unknown. His lawyer, Muhammad Al Tajir, has said that he has not been able to locate him. His wife and daughters, who were travelling with him, were also arrested, but were released after being interrogated. Sample letter to the Prime Minister of Bahrain, His Highness Khalifa bin Salman al Khalifa. We are extremely concerned about the detention of Dr. Abduljalil Al-Singace, the Chairman of the Human Rights Committee of the Haq Movement, who was arrested at Manama Airport on the morning of 13 August, when returning to Bahrain after a visit to London. According to reports we have received, Dr. Al-Singace – who is severely disabled and confined to a wheelchair – was roughly handled during his arrest. His wife and daughters were arrested with him, and only released after several hours. Mr Mohammad Al Tajir, Dr. Al-Singace’s lawyer, has reportedly been unable to locate him or meet with him to ensure his welfare. We are equally concerned about the subsequent arrests of other activists in Bahrain since Dr. Al-Singace’s arrest, including Abdul Ghani Al Khanjar, the spokesman of the Committee of Martyrs and Victims of Torture, Sheikh Saeed Al Nouri and Sheikh Mohammad Habib Al Miqdad, Mr. Jaffar Al-Hessabi, Dr. Mohammed Saeed, Mr.Mirza Al-Mahroos, and Mr.Abdulhadi Al-Mukhuder. This is a serious development about which we and other observers of Bahraini affairs are extremely concerned. Dr Al-Singace is an internationally renowned figure, known for representing the political aspirations of the Bahraini people around the world. During his visit to London, he spoke at a seminar at the House of Lords of the British Parliament on 5 August, discussing the human rights situation in Bahrain. He had also had meetings with the Islamic Human Rights Commission, Amnesty International and other human rights groups. You should also be aware, therefore, that Bahrain’s image in the world is seriously affected by such incidents, of which there have been too many in recent months and years. Bahrain is a country with pretensions to political reform and moderation, as reflected in Shaikh Hamad bin Isa al-Khalifa’s statement on 12 August appealing for critics of the government to return to the country, and promising them freedom of speech and action. These pretensions are totally exposed by episodes such as this one, which can only raise questions about the sincerity of the government in its claims to be progressive and democratic. The recent arrests are blatant breaches of Bahrain’s commitment under international treaties of which it is a signatory. In its response to the UN Human Rights Committee’s Universal Periodic Review (UPR) report, the Kingdom of Bahrain reiterated its intention to improve the human rights situation in Bahrain, including on the issue of arbitrary detention. Episodes such as this latest one shows to the world that Bahrain still fails to respect the rights of civil society activists, opposition groups and other Bahrainis to free assembly, association and speech, or to guarantee that the repression and persecution of such groups is ended. You, as the head of the government, should be aware that this baseless detention reflects poorly on the international image of Bahrain, and should take immediate steps to end his detention. You should also ensure that all government officials and agencies are made aware that this is not an acceptable way to conduct the governance of the country. Any failure on your part to do this will confirm suspicions that the Bahraini government’s commitment to freedom and human rights is hollow, opportunistic and worthless.